We were contact by the Leadership and Transformation, People and Culture Manager who was looking to inspire and motivate their education team, at TAFE Queensland, Brisbane. The delegates were TAFE educators (teachers, workplace trainers, tutors, case managers, clinical assessors and educational team managers). All were attending a conference held at the Brisbane Convention and Exhibition Centre. While our database is extensive, we immediately thought of several presenters who are well equip to inspire and motivate this particular audience. After taking the time to consider the client's brief, a few key options capable of delivering the required outcome, were forwarded to TAFE Queensland, Brisbane. Having seen countless presenters first-hand, we have a high degree of confidence when sharing our ideas, recommendations and knowledge with our clients. We have a strong ability to tailor the ideal presenter solution, according to the brief and outcomes of the client. 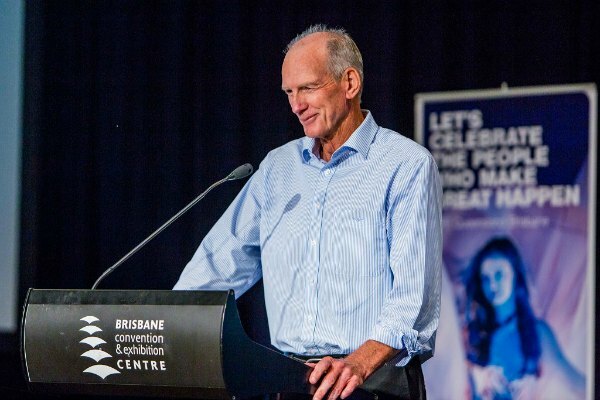 The client chose to engage Wayne Bennett, as the best solution for their corporate event. Listed below is the feedback received from TAFE Queensland Brisbane, Senior Advisor, Educator Capability. These words are by no means the exception, Wayne's presentation style and delivery is always well received. "I just wanted to personally thank Wayne for his inspiring and thought provoking speech that he delivered to our TAFE Queensland, Brisbane audience on the 20th of January. The week after the conference, we traveled around the different campuses delivering training and found that his speech opened up a lot of discussion. The phrase I heard most was "why have I applied my handbrake" and I found staff honestly reflected on his words of advice. The funniest comment was from a dental educator who told me he enjoyed being roused on and was going home to think! For me, I was absolutely delighted to meet such a warm, generous and humble man. I found him to be respectful and present to all those he encountered and I became a broncos fan immediately upon meeting him. So a BIG THANK YOU for making our event meaningful and real for our people. My bar was raised for just meeting him on that day and I know his words will carry forward in my life. Thank you and all the very best." Read more about Wayne Bennett.